How to draw Karin from Street Fighter. In this drawing lesson, you will learn to draw Karin with step by step drawing instruction. The step by step images provide useful information and insight of my drawing process. It is a the way that can help you progress. In this tutorial, you will learn to draw a Karin’s face and overall female body. Karin is one of the female the characters in Street Fighter Alpha. I will also show you how to draw her costume over her figure. It is also important have some knowledge of anatomy, but you don’t have to know every muscles on the body. More often than not you will have to design outfit over the body, but it is still very important to make your female character appealing. Best way I would suggest to learn anatomy is to go to life drawing session. Gesture drawing will help you understand dynamic movement and poses while longer poses will help you learn anatomy and muscle structure in real life. This drawing took me about thirty minutes to draw just for tutorial purpose. At the beginning, I usually start drawing the character with gesture lines to get the basic structure and pose of a character. It is very important to get correct shape, proportion, and accuracy for initial sketch. This way, when you make a final drawing, your drawing will be accurate. Remember to keep it simple and correct before going on to the next step. Karin is from the super wealthy Kanzuki family, whose motto is “All you need is victory” and, alternately, “The worst we’ll ever be is the best”. As a self-styled rival of Sakura, Karin naturally has a similar outfit, complete with red and white with a blue bola tie, but uses the martial art she created herself instead of the original style Sakura uses. Her hair is styled into long, oversized ringlets in a European Victorian-era fashion, and she occasionally wears a blue bow in the back. She also unusually wears her spandex biker shorts underneat her mini skirt. Here is a final drawing of Karin from Street Fighter. 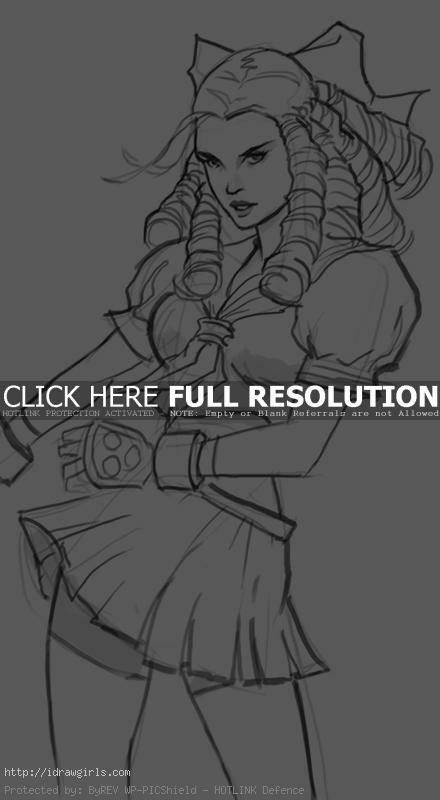 Below are step by step images how to draw Karin from Street Fighter. Step one, I just drew loose head shape and her upper body. Step two, I then drew her hip, legs and her arms. Just think of it as you are sketching simple gesture drawing. Step three, I then added detail to her face (eyes, nose and lips). I also roughed out base for her hair style. Step four, I sketched out her upper body’s costume very roughly. Step five, I added her fighting gloves, skirt, and biker’s shorts. Step six, I slowly drew over the existing rough line drawing with darker solid final lines. Step seven and eight, I finished the rest of the body with darker line drawn.